In a conversation in Chuokoron with Nara Ichijo High School Principal Kazuhiro Fujihara, Minister of Education, Culture, Sports, Science, and Technology Yoshimasa Hayashi revealed his general thoughts on the educational reforms to be implemented in the 2020 school year, including university entrance examination reforms. He emphasized that the goal of these “High School and University Articulation Reforms” is to increase fundamental academic ability considering lessons learned from the yutori education system, and to educate and evaluate based on the three key scholastic skills by 1) Stimulating acquisition of sufficient knowledge and technical skills, 2) Increasing reasoning, decision-making, and self-expression skills to find answers to questions without one clear answer, and 3) Studying by proactively cooperating with diverse people. 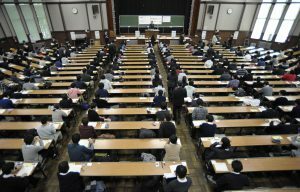 In a report in Chuokoron, high school-university collaboration coordinator Shiki Kurabe agrees with the overall direction of the education reforms, while noting concerns over the proliferation of “reform exhaustion” among educators and the increase in outsourcing entrance exams to private companies. In particular, he presents the example of how even though the number of students dropping out of university has been increasing throughout Japan, high schools are unaware of that situation, and their reliance on private companies for services such as guidance counseling is “making the problem worse.” He notes that the number of dropouts from universities, junior colleges, and vocational schools has risen to between 110,000 and 120,000 every year, with a 3.3% dropout rate per year, and 12.6% of students in four-year universities dropping out before graduation. Furthermore, he states that many of these dropouts end up unemployed or as temporary employees.